In Entrance Class through 2nd grade music is taught as part of the homeroom hours – students sing songs and rounds in English and German and meet in a big grade level singing circle once a week. Starting in 3rd grade students have one hour of Music instruction taught by a specialist in one of the JFKS Music rooms. They can choose to participate in the 3rd/4th Grade choir as an after school activity, or join the Recorder or Young Composers group. In 5th and 6th Grade the JFKS Music Core Program combines one hour of General Music Class with one hour of Applied Music Class. 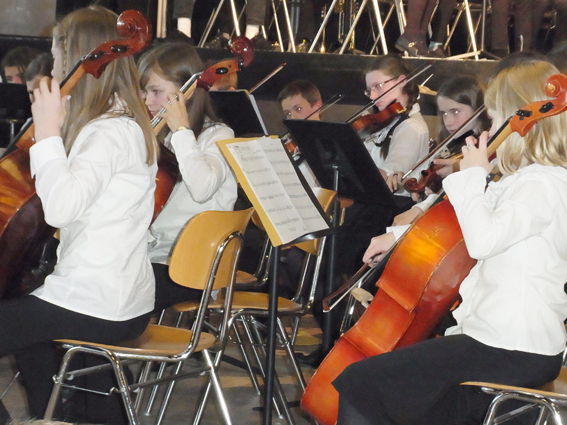 Students have the option to learn an instrument and join Band, Orchestra or Choir. Please check 5th Grade Music and 6th Grade Music for more detailed information.